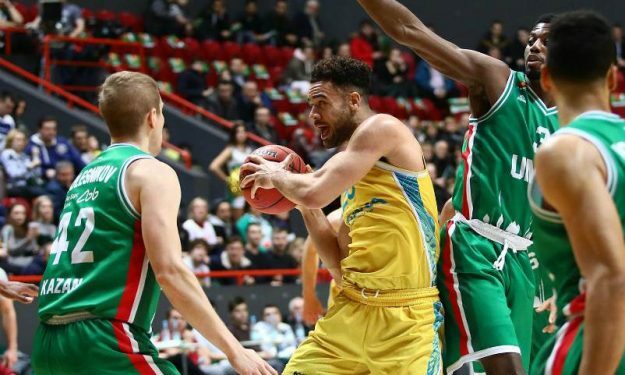 Astana took down Unics Kazan. Astana delivered one of the biggest upsets this season in VTB League by beating powerhouse Unics Kazan 98 – 95 on the road. Backed by an outstanding Pierria Henry (34 points and seven assists), Unics was up by eight, 89 – 81 with 2:30 remaining but Astana rallied for an impressive comeback. Michael Jenkins capped the turnaround with this go-ahead 3-pointer for the 91 – 92 with 30 seconds remaining. The Kazakh side remained up. Jenkins finished the game with 24 points. J.J. O’Brien added 18 points and 13 rebounds while Anthony Clemmons had 16 points and six assists for the winning side that improved to 8 – 10 and returned to the playoff spots. Unics fell to 14 – 4, despite Henry’s and Raymar Morgan’s (20 points, five boards) efforts.